Elder care. We are living longer, but as we age many of us will become frailer and we’ll need help with basic activities of daily living. That’s true whether we continue living independently, or move to assisted living or skilled nursing homes. When her children were young, Theresa Brown, RN, made a mid-career change: from English professor at Tufts University to nursing, and chose to specialize in medical oncology. We should all be glad she did, because she has chronicled her experiences – and by extension, illuminated some of the most pressing issues and challenges in our health care system – in two excellent books as well as in personal essays in The New York Times. And she does it with clarity, insight, humor and understated eloquence. Her voice is important because nursing truly is the heart of care for the ill. No other health professionals spend as much time providing hands-on care for the sick than nurses. Our health care system is increasingly complex, technology-laden and hyper-specialized. So the need for a humanistic perspective from those who are on the front lines has never been more pressing. I had the great pleasure of interviewing Theresa recently, following her book tour for The Shift: One Nurse, Twelve Hours, Four Patients’ Lives. The book focuses on a day in her life in the oncology ward of a Pittsburgh teaching hospital; she subsequently left that position and currently works as a hospice nurse, visiting people in their homes. Theresa told me that she is comfortable in her current role as a home hospice nurse. In fact, she said, one reason she made this switch was that she always likes to learn new things and wanted particularly to learn about how the kind of care provided for patients at home might ultimately be transferred to the hospital setting. Care that offers more dignity and privacy for patients, such as letting patients sleep when they need to; or even wear their own clothes; and making it easier for family, friends and caregivers to visit any time and stay overnight if need be. “It would be great to go back to a hospital and say, how can we make things better?” she said. “Creating a balance of comfort and quality care.” Even making the decision not to wake people in the middle of the night would be an enormous change, she pointed out. There is no doubt in my mind that Theresa will keep learning – and educating us along the way – and that she’ll continue to make a difference in reaching the goal of improving patient care. In the meantime, you can order books, read her columns or join her mailing list at http://www.theresabrownrn.com. If we’re talking about developments that have the potential to make a big difference for patients in the coming years, though, I’d like to suggest at least two that ought to top the list. My first “top news” story affects advance care planning. At long last, as of January 2016, you and your doctor will be able to discuss your goals, beliefs, values and fears should you become seriously ill – and Medicare will actually reimburse him or her for doing it. Granted, the reimbursement isn’t huge — $86 for a mere 30-minute discussion and $75 for a follow-up – but maybe it will be enough of an incentive to encourage more physicians to engage in these critical conversations. These are difficult discussions to engage in, whether you’re talking with family and friends or your physicians. And too many physicians’ communication skills leave something to be desired. But the goal is to make sure that if you become very ill – particularly if you are not able to speak for yourself – your care will reflect your wishes and values. My second “top news” story was the selection of hospices that will participate in the Medicare Care Choices pilot project, with implementation beginning in January 2016. The Care Choices pilot will allow certain hospice patients with advanced cancers, chronic obstructive pulmonary disease (COPD), congestive heart failure, or HIV/AIDS to elect hospice care without having to give up curative treatments. Originally, the Centers for Medicare and Medicaid Services (CMS) was going to pick at least 30 rural and urban Medicare-certified and enrolled hospices to participate. It expected to enroll 30,000 beneficiaries over a three-year period. But because there was so much interest in the pilot, CMS expanded it to more than 140 Medicare-certified hospices and extended the duration of the project from three to five years. It expects to enroll as many as 150,000 eligible Medicare beneficiaries. Why is this important? Because the idea of forgoing treatment aimed at cure – currently a requirement to enter into hospice care – has discouraged too many patients and their physicians from considering comfort care solely. Ideally, when the pilot is done, there will be useful evidence about whether concurrent care (curative and comfort) improves quality of life and results in fewer hospital readmissions and, possibly, lower Medicare costs. In my “wishful thinking” category: Maybe in 2016 CMS will announce it is eliminating the six-month prognosis requirement for patients to enroll in hospice care. That would certainly get my vote for top medical news story next year! Surprisingly, many people do not know what palliative care is despite its great strides in recent years. A Consumer Reports survey of more than 2,000 adults, for example, showed that 61 percent had never heard of palliative care. As the population ages and the demand for palliative care grows, the ability to assess quality throughout the country and across care settings is increasingly important, as Dr. Joseph Rotella, chief medical officer of the American Academy of Hospice and Palliative Medicine (AAHPM) and co-chair of its Measuring What Matters Clinical User Panel explained. And because there has been “no consistency regarding which measures are required by various groups, from accrediting organizations to payers,” AAHPM and the Hospice and Palliative Nurses Association (HPNA) came up with “measuring what matters” quality indicators. A comprehensive assessment (physical, psychological, social, spiritual and functional) soon after admission. Screening for pain, shortness of breath, nausea and constipation during the admission visit. If you screen positive for at least moderate pain, you should receive treatment (medication or other) within 24 hours. Patients with advanced or life-threatening illness should be screened for shortness of breath and, if positive, to at least a moderate degree, have a plan to manage it. Engaging in a documented discussion regarding emotional needs. 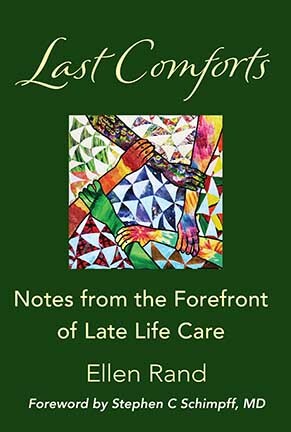 Hospice patients should have a documented discussion of spiritual concerns or preference not to discuss them. Documentation of the surrogate decision-maker’s name (such as the person who has health care power of attorney) and contact information, or absence of a surrogate. Documentation of your preferences for life-sustaining treatments. Vulnerable elders with documented preferences to withhold or withdraw life-sustaining treatments should have their preferences followed. You or your family or your caregivers should be asked about your experience of care using a relevant survey.